Back in 600 BC, King Servio built a great wall around Rome and fortunately for NH Collection Palazzo Cinquecento Hotel, it has to share its lawn with a few large chunks of it. Of course, it’s just what you would expect from a city teeming with antiquity, but still, it’s pretty special to have some of it right outside the front door. 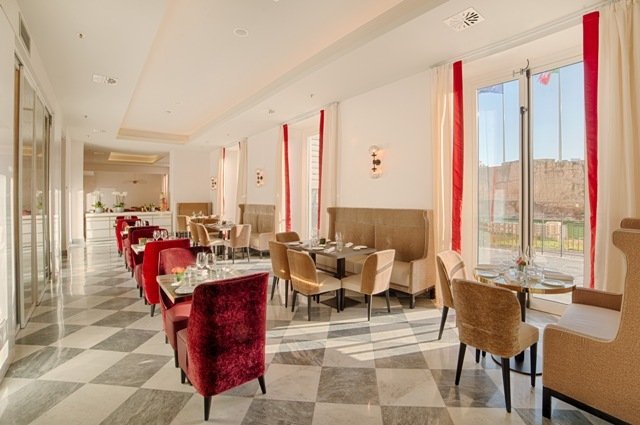 This is a brand new luxury hotel built on what was once the Art Nouveau headquarters of Italy’s rail and postal service, literally a stone’s throw from Rome’s Termini Station. You might think this a strange choice of location as mainline stations have a tendency to attract a colourful collection of humanity, but this is Rome, one of the World’s most popular rail destinations and I think it’s a genius move. It’s a beautiful property which manages to combine cool modern urban design around a travel theme with historical elements of the original building’s classy interiors (there’s even a rumour of railway tracks in the basement). 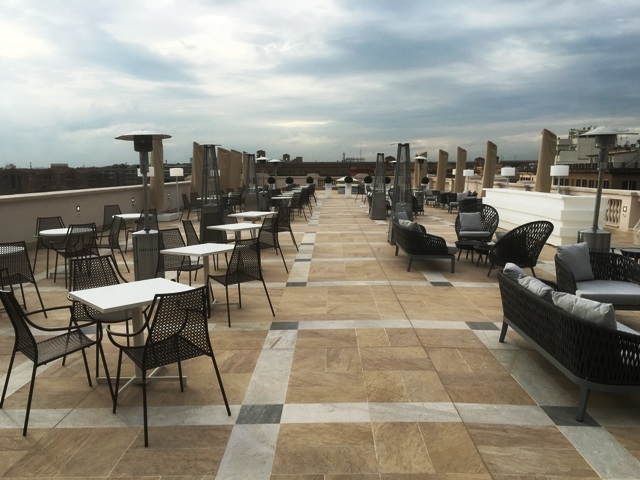 It’s what NH Hotels, one of Europe’s biggest hotel groups call their Collection range; upper upscale properties unburdened by stuffy formal luxury in the classic sense, focussing instead on high quality modernist chic, appealing to couples and families who enjoy living the good life. 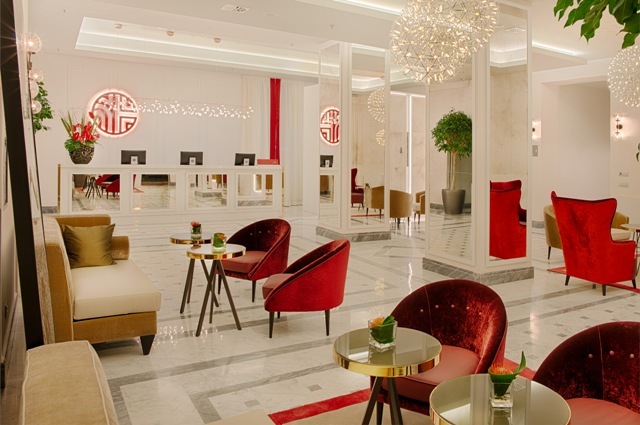 The lobby practically screams this as I arrive; white marble everywhere set off by trendy red velvet chairs, a huge gold framed mirror leaning lazily against one wall and two glass jugs filled with fruit infused water. Upstairs my room is surprisingly spacious, a wide wooden floor and huge bed dominating proceedings, with a very comfy retro armchair to fall into after a hard day walking Rome’s cobbled streets. The bathroom holds another surprise; an industrial hairdryer no less, completely wasted on me but I can see the good life couples almost fainting with excitement. Same goes for the tropical rain forest shower head. 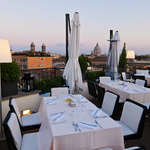 The rooftop terrace is a stunning space overlooking Rome’s skyline in every direction. 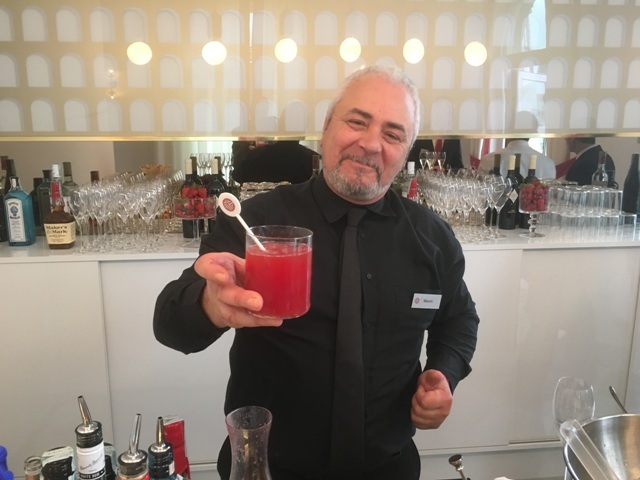 I get a signature Collection cocktail. Corporate red of course, made with rum and Campari and sit at one of the many very comfortable couches letting the sounds of Rome wash over me before setting out on Edwardo’s culinary expedition. It’s the next morning following a colourful Roman evening of excellent local wine and pasta and the Grant Tour restaurant awaits for breakfast. Italians are surprisingly spartan when it comes to breakfast, normally a couple of espressos or cappuccino’s and some cake or a pastry is all they need. The rest of us of course, demand something much more substantial and the NH Collection Palazzo Cinquecento Hotel passionately delivers. A lot of fresh fruit, fresh breads, juices and cheeses, plenty of hot buffet options and a menu of eggs to order. I take my choices and eat sitting outside on the small terrace to enjoy the early morning sun with Servio’s walls as silent spectators. 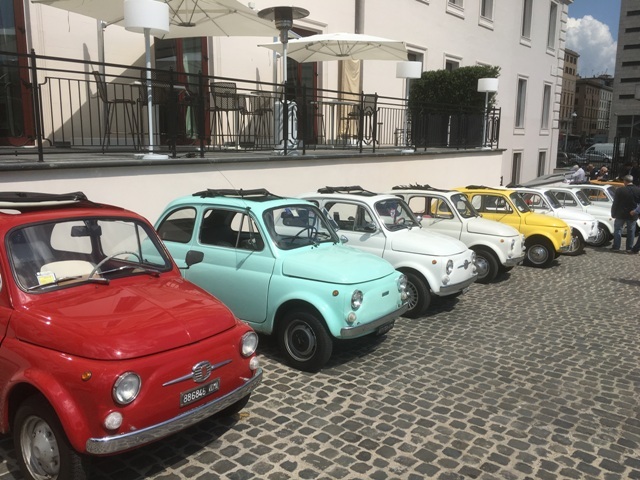 There’s a collection of tiny vintage Fiat 500s lined up on the drive getting admiring glances from everyone walking by. My small chariot awaits for a guided tour around Rome’s sights by a local member of the Association of Fiat Owners who offer tours as a service to tourists looking for something a little different. It was little and very different , a perfect alternative way to see Rome for sure. 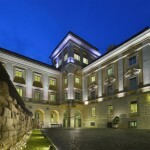 I’m very impressed with NH Collection Palazzo Cinquecento Hotel. Purists might argue about the lack of a pool or a spa, although there is a small gym. Pools are rare in Rome hotels because there simply is not enough space. They might even argue it is not central enough. 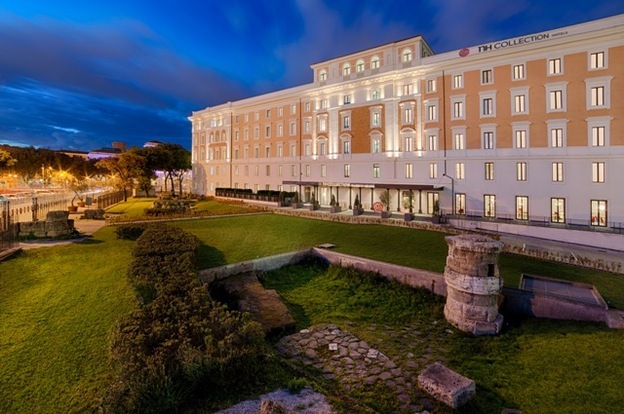 I would say it is far enough away from the crowds and walking distance to any of Rome’s famous sights, indeed a new less famous historical jewel has been recently renovated just a few steps from the hotel; the Diocletian Baths. And let’s not forget, the Termini metro is just a few steps in the other direction. Then again, Servio’s walls have been around for a long time too and I bet if you asked them, they might give the hotel an Imperial thumbs up. 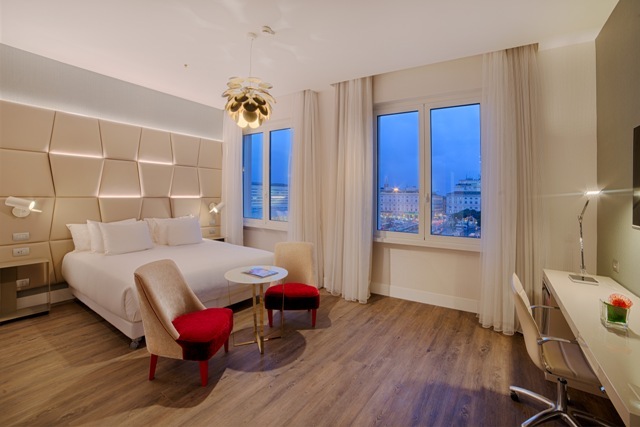 Rooms at the NH Collection Palazzo Cinquecento Hotel Rome are from €289 per room per night and €330 with breakfast per room per night. Rome Fiumicino – Leonardo da Vinci airport is serviced by many airlines including low cost and main carriers from London Gatwick and most other major airports in the UK.